I will let the article do all the talking, hear from what you guys have to say, and then put my 2 cents in it. I would like to announce the unveiling of a new tool designed specifically for the performance of Follicular Unit Extraction (FUE) surgery. It is my hope that every doctor already performing FUE surgery, or those who would simply like to start offering this wonderful procedure to their patients, will explore this new tool and perhaps add it to their own clinical practice. Incorporated into its design are practical solutions to problems that have plagued the FUE industry since it’s introduction to the Western Hemisphere in 2001. Deleterious forces resulting in graft damage during FUE procedures such as: Torsion, Traction, Compression, Overheating, and Desiccation are addressed and minimized using this new instrument like none other. This tool also offers the unique combination of LOWERING operator skill level requirements while actually RAISING the quality of each and every extraction. This translates to faster “ramp-up” times for new doctors interested in adding FUE Hair Transplant surgery to their practices; as well as making for easy and near seamless integration into clinics that already offer FUE to their patients. 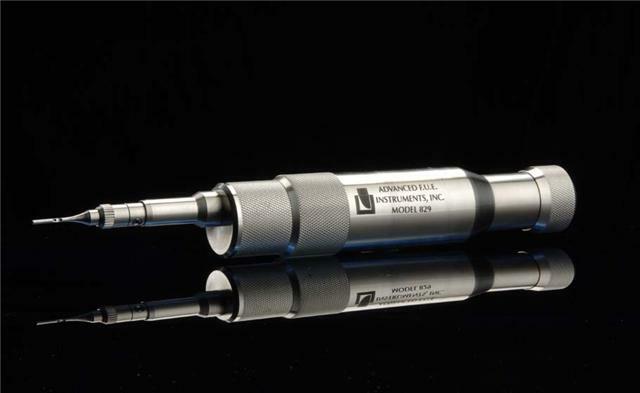 This device allows not only for greater quality of extraction, but greater speed as well. Much greater. And all without any extra risk to the grafts themselves. The same cannot be said of other FUE tools on the market. All these unique benefits result in far less fatigue for the doctors, technicians, and patients. It’s important not to forget this all important (but often ignored) human factor because in the end any “work product” will only be as good as the vitality, enthusiasm, and confidence possessed by the doctor and team at the time of the procedure. The obvious purpose of the tool is to facilitate the FUE procedure for practitioners; but that is only part of a far greater strategy: the sparking of a new and legitimate industry that’s inclusive of ALL practitioners-novice and veteran alike. The bigger picture is to elevate the current “cottage industry” status of FUE to a more mainstream role in hair transplantation; and to forever strip away the mystery, hype, and secrecy with which it has been unnecessarily surrounded by since it’s inception. All clinics are welcome to this tool. I will not veil it in secrecy nor will I falsely claim it as the “magic wand” of FUE. As a veteran FUE practitioner I could claim this device solely for my own HT clinics and advertise it as such to gain a competitive edge. However, for this field to grow, the credibility and exposure of the FUE technique must increase, and I can think of no better way to achieve this than offering a device that makes it easier for hundreds or thousands of other doctors to get into the FUE field themselves. Once they get a taste of the success I’ve had with FUE over the past 7 years, a greater number of doctors will join the FUE ranks. More successful FUE practitioners means greater numbers of satisfied patients, and thus a more popular procedure with ever increasing demand. Everyone wins. My company, Advanced FUE Tools, Inc. is not just some name I slapped on the door of my current HT practice clinics just to sell a few tools. Rather, it is a well supported and financed group of businessmen, master-machinists, draftsmen, technicians, problem-solvers, thinkers, and attorneys, who have dedicated themselves to the development of this product for years. Like an actual FUE procedure, TEAMWORK is what made this device not only a reality, but a clinically practical and useful one at that. I’ve used this tool, or fundamental aspects of it, through various generations of such devices for just about every FUE procedure that I’ve posted on the web since 2003. This means it has been used and tested for years. Each component of this device taken in-and-of itself separately, or combined as one device, has a proven “real-world” track record. This established pedigree was something I insisted on for years before going public with it. Now is the time for this tool to join the pantheon of practical medical devices that helped form and shape hair transplantation into the enormously successful industry it has become. I have avoided lengthy technical detail in this write-up as I felt it went beyond the scope of an introduction. Doctors may of course contact me directly if they have any specific questions or concerns. I will be offering much more information and multi-media about the device in the near future, but wanted to introduce not only the device, but some of the thought and philosophy that made the design and production of this new FUE instrument a reality. Nice photo, so how big is this new tool, less than 0.75mm? Great, that means he is finally able to do FUE correctly now? I sure hope that this tool can help him. He needs it. » that this tool can help him. He needs it. It looks very futuristic indeed. We always have open mindset and are willing to give it a go, why not ? Looking forward seeing some more details about this new device. Maybe it would be a good idea to present it at the annual IShrs in Amterstam in July. » It looks very futuristic indeed. bverotti how does it compare to a 0.75mm punch? I think your doctor uses 0.75? Right on, I just find it hard to believe that one tool can turn all technicians into skilled fue experts. How is it different from what doctors are using now? Errrrrrr!! !I cant stand Dr Fellers pompus attitude. He really believes he’s a genious, a pioneer, an inventor. A legend in his own mind really. Kinda feel bad for the guy that he hasnt achieved more consistency with FUE yet. I guess some people are born with it while others have to try really hard just to keep up. It’s just too bad Dr Feller cant accept that fact and instead praise his peers who have surpassed him…Its not good enough for him to just be “good”. He HAS to be the best or he’s not happy. Pity of a character flaw. Is this the drill that people are talking about? It looks like a tiny syringe needle, it 's misleading to call it a drill. It looks like the same drill my dentist uses, I think Feller’s tool appears to be smaller. I dont think its a drill, i could be wrong, but I think Feller has better ethics than that. He knows how delicate a procedure FUE is and the drill would be detrimental to the patient. » would be detrimental to the patient.